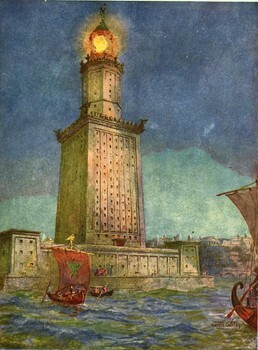 To the imagination of contemporaries the Pharos became Alexandria and Alexandria became the Pharos. Never, in the history of architecture, has a secular building been thus worshipped and taken on a spiritual life of its own. It beaconed to the imagination, not only to ships at sea, and long after its light was extinguished ...memories of it glowed in the minds of men." "This is a very fascinating website, the most erudite one I have ever seen, to say the least! Many Congratulations!" I have seen your site (briefly) and think the collection offers much 'food for thought'. Since the Library of Alexandria also aims to be a place of dialogue and debate for "scrutiny of many apparently conflicting systems of statement, as sort of clearing house of misunderstanding' it can give ample ideas for thought useful in many programs for us as well as others."